Despite the abandonment of the Euro 2016 qualifier between Serbia and Albania, relations between the two countries are improving. Albania captain Lorik Cana (No. 5) seen here throwing a punch at a pinch invader during the abandoned game against Serbia. The draw for the European Championship qualifiers which took place in Nice on February 23rd last year threw up a titillating obscurity which satisfied an itch usually only arrested when the ball hits the corner flag or a free-kick is awarded inside the 18 yard box. These are the once-in-a-season oddities that catch the eye and moisten the lips on account of their precious rarity and downright peculiarity in a game that is so familiar to us. Spain hadn’t made good on their threat to walk out on UEFA if Gibraltar got the nod, but they did manage to wrench the concession from Nyon that the draw would be ‘fixed’ to keep them apart. The balls, almost inevitably, had other ideas and into Group 3 were drawn Gibraltar alongside their illustrious but un-neighbourly neighbours. President Michel Platini, officiating, called no-ball and Alen Bulla’s team of part-time hopefuls were switched from a group containing the world champions to one containing the champions elect. So instead of a hiding in Madrid last October the Rock received an entirely different hiding in Munich. Welcome to the party boys. 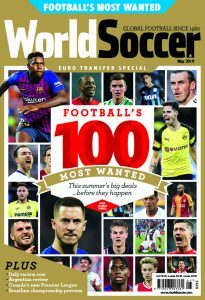 The switch-move foible in Nice turned out to be a remarkably prescient forebear to an episode that dominated column inches in the international sports press and beyond in the final months of 2014. From the moment referee Martin Atkinson hurried the Serbian and Albanian players from the pitch under a hail of missiles, water bottles and garden furniture and abandoned October’s Group I meeting between the two sides, Europe was alive with an angry creed demanding to know why UEFA hadn’t foreseen the tempest in Belgrade and kept the Serbs and Albanians apart. Wasn’t there precedent, after all? 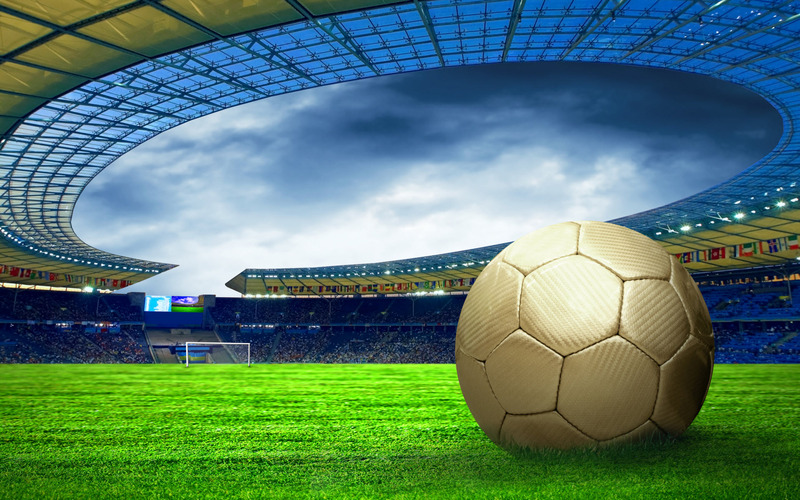 Azerbaijan and Armenia had seen their matches against one another for the 2008 championships cancelled without a ball being kicked and now enjoy the same separation security demanded by Spain. Georgia and Russia too, following a decade of war and diplomatic collapse, are protected by UEFA statute from facing each other in competition. Not so Serbia and Albania. But the governing body might just have made the right call this time. Because to use the melee in Belgrade as a reason for separation is to misunderstand the reasons why UEFA pass these judgements in the first place. Immunity from the unchecked randomness of the draw is demanded, to different extents, by the nations involved because of a checklist of idiosyncratic quirks that single out their relationships with their neighbours as unique within Europe. In the Caucasus, Armenia and Azerbaijan are technically at war over the disputed territory of Nagorno-Karabakh that sits at their border. A ceasefire was declared in 1994 but this is a diplomatic misnomer – there are regular skirmishes in the Karabakh foothills and the Armenian communities that inhabit them live in limbo circumstances of industrial and social dislocation from the economic centre of the capital Yerevan, penned in by a permanent state of Azeri militarisation. To the Azeri this is occupied land, and refugees from the war still gaze up into the mountains to see their former homes taken up for Armenian military purposes. For them to welcome a visiting Armenian team onto their soil would be to entertain visitors representing an occupying force. It is inconceivable within the context of this war that a practical framework could be put in place for a football game to happen. The picture across the Caucasus Mountains is hardly any rosier. Russia went to war with Georgia twice in the 00’s over the autonomous territories of Abkhazia and South Ossetia and since 2008 all diplomatic relations have been severed. Georgia considers Moscow’s support for Abkhazian and Ossetian irredentism to be intransigent to the point of provocation, and the moral and military support that Russia has provided over the last decade to the separatists has been the diplomatic equivalent of two fingers to Georgia’s historic borders. Spain and Gibraltar have of course suffered far less bloodshed in their centuries-old stand-off, but the blueprint reads the same. In each case, two states reject one another’s right to exist in their present form, and the dogma is state sponsored. International football is impossible because there is no mutual recognition that these states even exist within the boundaries acknowledged by the United Nations, and by UEFA. Fly south to the Balkans, for so long Europe’s flashpoint, and quite a different process is underway. “The US and the EU, especially Germany, view recent electoral results in Albania and in Serbia as a turning point towards greater regional cooperation and as an opportunity for burying the hatchet by Albanians and Serbs” ran the opening lines of a report into the changing state of Balkan relations by the International Institute for Middle East & Balkan Studies (IFIMES) in November, citing the recent rise to power of political moderates Edi Rama and Aleksander Vucic. In an interview with German news agency DW.DE Albanian president Rama summed up neatly the double-edged sword of Serb-Albanian relations in 2015: “Most Albanians want a “Greater Europe” with Albania, Kosovo and all countries in the region. However nationalism remains without doubt a great danger to our region, plagued as it is by unemployment and poverty.” The message from the top is clear. Diplomatic relations in the former Yugosphere are becoming tighter – all that is necessary now is for public attitudes to catch up. A remote controlled drone plane carries the Albanian flag over the pitch during Serbia’s Euro 2016 qualifier against Albania in Belgrade. 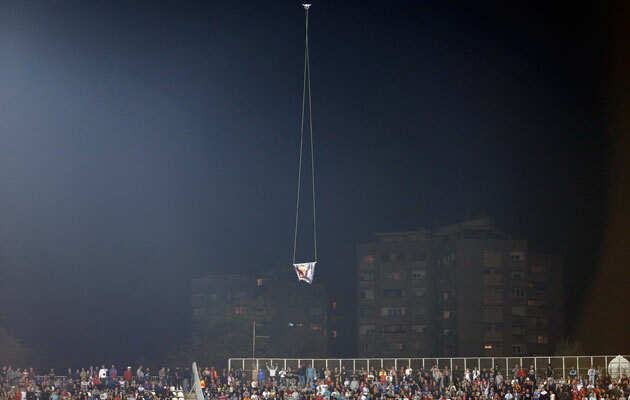 This much was in evidence amid the chaos at the Partizan Stadium in October. The violence on the pitch was a corollary of a nationalism fuelled by economic hardship and a lazy cross-cultural narrative, but this doesn’t reflect the bridge-building policies of two emerging states with EU membership firmly in mind. The Red & Black Alliance, the only political party in Albania to openly campaign for the realisation of the ‘Greater Albania’ etched onto the flag flown over the pitch during the match with Serbia, received barely 10,000 votes in the 2013 leadership elections, whilst over the border the notion of a ‘Greater Serbia’ shed its last shrapnel of political currency when the Radical Party were ousted from power last year in Belgrade. Even the great sticking point in the southern Balkans, the Kosovo question which divides the two states both physically and ideologically, is edging in the direction of resolution, as concessions towards autonomy for the Serb-majority in the north of the province look to settle much of the unrest which has dominated since the turn of the millennium, even if full independence for the self-proclaimed republic is still not on the table. So how are UEFA to interpret all this? The terraces may have been a hotbed of racist vitriol when the sides met but the notoriously fragile relationships between ethnic groups in the Balkans are toughening up across the board, a reality publicly emphasised when Berlin hosted government leaders and heads of state from across the region for a conference on regional co-operation and development in Berlin in August. German chancellor Angela Merkel made it clear at the summit that Albania, with Rama at the helm, are viewed by the West as a major player in hauling the whole region towards closer alignment with Brussels with a view to EU membership. Neighbourly relations with Serbia are a key condition in this process, and too damn valuable to the stability of the region to risk. Overlooked by most commentaries in the aftermath of the storm at the Partizan Stadium was the fact that the Albanian federation had, contrary to reports, been given the option to take away fans to the match, on the condition that all ticket holders must also hold Albanian passports. The idea was rejected on the grounds that it would exclude the vast Diaspora of ethnic Albanians scattered around the region, specifically in southern Kosovo. Suffice to say that the match organisers held sufficient faith in Serb-Albanian relations that they were willing to allow both sets of fans into the same ground. The neat rhetoric of two nations culturally at war has been a useful screen for UEFA and the respective federations against any serious probing into stadium security, which is surely where any inquest into what happened that night should begin and end. In the end what message does it send to Europe if sides are kept apart on the strength of a teeming dislike between fans? Belgrade was a blot on UEFA’s copybook in the context of the ultra-modern match-day experience, and a remedy lies in improving the mechanisms of stadium safety, not in the dividing up of European football along lines dictated by out-dated ethnic prejudices that aren’t reflective of recent progress. Understand that, and the game might enjoy a future where Platini’s ball-juggling routine is the exception rather than the norm.